The history of the black-tailed deer has shown both the positive and negative influences man can have on wildlife. 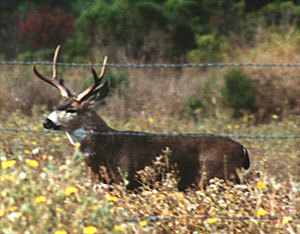 During pre-settlement times, the black-tailed deer were abundant throughout its range. From 1800 to 1850, the black-tailed deer population in California (including the mule deer) was almost 800,000 animals. With the increase of settlers during the last half of the nineteenth century the black-tailed deer population rapidly declined. Unrestricted market hunting and habitat destruction, such as cutting, burning, farming, and grazing, contributed to most of the decline. In the late 1800s and early 1900s, token laws restricting the killing of black-tailed deer were passed, however, they were largely ignored and unenforced. Between 1850 and 1910, the black-tailed deer population reached an all-time low in California. The population (including the mule deer) had dwindled to less than 300,000 animals. Through the enforcement of regulations and proper habitat management, the black-tailed deer population rapidly increased from 1910 to the 1940s. In that short time, the black-tailed deer had been restored to the carrying capacity of its range. The black-tailed deer population then stabilized and continued to increase slightly into the 1960s. In recent years, California deer populations have experienced declines in several areas of the state, while in others, populations have remained fairly stable. The story since then is clear, proper management promoted population growth, which was accompanied by people's growing interest in the black-tailed deer for sport hunting and viewing. Recent management efforts have attempted to balance population levels and designed hunting regulations to achieve them. The success of the black-tailed deer program is a tribute to state resource agencies, hunters, the general public, and the adaptability of the black-tailed deer. The ancient deer of genus Odocoileus dates back to approximately 2.5 to 13 million years ago and started out north of the Arctic Circle. These ancient deer were probably the size of a rabbit, had fangs, five toes, and no antlers. As the climate cooled and the glaciers formed, the deer and their habitat moved south. Around four million years ago, the ancestors of the modern day deer reached the United States. These ancient deer browsed as edge species, much as the deer of today. Then about one million years ago, the first black-tailed deer appeared. About 11,000 years ago, many of the larger animals that roamed throughout North America began to die off. The reason for this die-off is not known for sure. Most experts believe it was due to an increase in the temperature. During this time, many deer species that inhabited North America died off. Nonetheless, black-tailed, mule, and the white-tailed deer survived, most likely due to their ability to make use of both open and dense habitats. There are two basic theories as to the development of the modern deer. The traditional theory is that black-tailed deer differentiated from white-tailed deer and then mule deer differentiated from the black-tailed deer. However, genetic studies point to another theory, that white-tailed and black-tailed deer mated and their offspring became the modern mule deer. Regardless, there are three major species of deer, white-tailed (Odocoileus virginianus), mule (Odocoileus hemionus hemionus), and black-tailed (Odocoileus hemionus columbianus) which is considered a subspecies of the mule deer. Some researchers believe that the mule and black-tailed deer are a species in the making. For the Indians, black-tailed deer provided meat for food, hides for clothing, shelter and bedding, and sinews for bowstrings, implements of war, and fish lines. Bones and antlers were used for arrows, needles, scrapers, and ornaments. The Indians used several methods for the taking of black-tailed deer in combination with weapons. Some of the most common were stalking, baiting, using open pits, and deer drives into traps or snares. The Indians also employed the use of camouflage. The Indians would use a deer head as a decoy and paint their bellies and chest white to look like a deer. After discovery by the Spanish, but prior to actual settlement, there was a period of 227 years during which California was occasionally visited by explorers. Records of these voyages, which only touched at points along the coast, do not give much information on the land or wildlife. The first Spanish settlement in California was established in 1769 in the area of San Diego. Subsequently, Spanish adventurers, missionaries, and settlers explored and occupied most of central and southern coastal California. References by explorers to wildlife are infrequent in journals of the time, however, the following are a few. Deer are mentioned by Juan Bautista De Anza as being common in the San Francisco Bay Area and on the plains west of San Jacinto and San Bernardino Mountains. 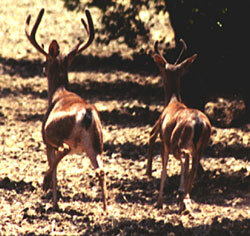 Palou also notes that they were abundant near San Francisco and has one reference to deer in the Santa Cruz area. In 1769, Fages mentions deer in the San Diego, Los Angeles, San Luis Obispo, and Jolon areas, and around San Francisco Bay. In 1792, Longinos Martinez reported deer as among "the most abundant animals" over much of the area from San Diego to Santa Barbara. The Spanish settlers, although few in number and restricted in the area they occupied, nevertheless brought about many changes in the land, particularly as a result of their introduction of domestic cattle, sheep, horses, and goats. These domestic herds were large and spread out. In 1825, it is estimated that there were 1,003,970 head of sheep at the Spanish missions, and about as many more kept by ranchers outside the missions. In 1846, references were made to droves of wild horses in San Joaquin County and beef was so abundant in California that game was hardly hunted or prized. Thus, the total impact of Spanish occupancy, except insofar as domestic livestock was concerned, was light in contrast with the changes to take place in the decades during and after white settlement. Jedediah Smith traveled over much of California in 1827-28. In August, along the lower Stanislaus River, he found some deer, but elk and antelope were more abundant. Later, during the winter and early spring, his party encountered deer in the vicinity of the Mokelumne River, American River, Feather River, and Chico Creek. In April the Smith party moved into the Trinity River area. Deer were apparently abundant all along the route down the Trinity and Klamath rivers. However, when they headed into the mountains north of the Klamath they saw no deer, nor did they encounter any along the coast until the vicinity of Del Norte County where deer were found in fair numbers. In October and November 1832, John Work entered Modoc County from the north and followed the Pit River down to Hat Creek where he crossed the divide to Cow Creek and the upper Sacramento. Works party found almost no deer until they reached Cow Creek. This implies local scarcity of deer in the Pit River area. However, around the borders of the Sacramento Valley, Sonoma, Napa, and Lake counties, Works party found deer in abundant numbers. They also reported numerous deer on the Marysville Buttes. Zenas Leonard arrived with the Walker Party, which crossed the Sierra Nevada in October 1833. No deer were reported until they reached the rim of Yosemite. When they descended lower, perhaps to the floor of Yosemite Valley, they found deer in great number as well as other game. George Nidever mentions an abundance of deer in the Santa Barbara area in 1837, which supports the observations that Longinos Martinez made nearly 50 years earlier. Fremont traveled along the eastern base of the Sierra in 1844, finally crossing the mountains in February. He found abundant deer signs on one winter range area northwest of Bridgeport, but elsewhere saw no deer until well down the west slope. 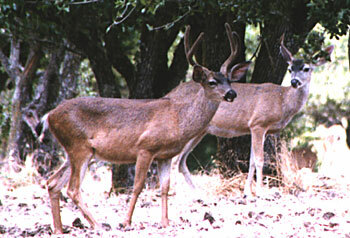 In the foothills along the lower American River, deer were encountered in abundance. In 1846, Fremont and Applegate found considerable numbers of deer in the Pitt River area. In August 1846, Edwin Bryant traveled up the Truckee River Canyon. Crossing the mountains he saw no deer, but stated that deer tracks were numerous. When the party reached the valley they saw large numbers of deer, as well as elk and antelope. Bryant also reported deer as numerous in the Santa Clara Valley foothills, in eastern Napa County, and around Clear Lake. From these accounts we gain the impression that deer originally were numerous in the coastal mountains from San Diego to the Klamath River and in the foothills bordering the Central Valley. Populations were moderate or locally abundant in the high Sierra, the Great Basin area, and Central Valley. They were scarce in the desert and the heavily timbered northwest. In terms of vegetation types, the areas of deer abundance were predominately chaparral and oak woodland. Frequent burning helped maintain a high carrying capacity in these areas for wildlife. Presumably lightning started most fires at high elevations, but from all accounts the Indians started numerous fires in the Coast Ranges and foothills, often to drive game to the kill but sometimes apparently for the express purpose of producing tender green forage.